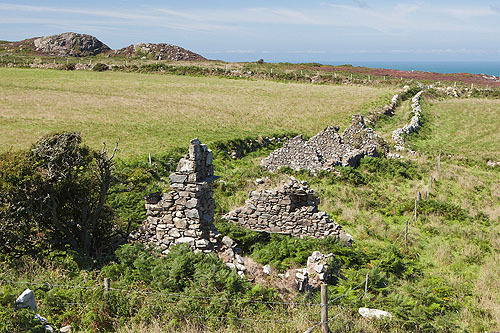 A view over the deserted settlement of Maes Y Mynydd . A small hamlet, in the shadow of Carnedd Lleithr and Carn Perfedd, with an old walled lane snaking towards the hidden bay of Gesail Fawr. In the 17th century , Quakers escaping from religious intolerance, settled in Maes-y-Mynydd and gave it the name Pennsylvania. In the 1890's there were only 6 people left in the village.